Through the generosity of Global Volunteers' Poland classroom sponsors, the students of a small village elementary school are enjoying field trips, new teaching materials, school supplies and books to learn English this school year. We're so grateful for sponsors' commitment to ensure that the students have resources for their intellectual and social development, and that their most important growth years are successful! The first semester has just ended, and the students are beginning the second one. The eight students of Grade 1 will continue to learn the letters of the alphabet and numbers up to 100 (in English, of course!). They will also practice their penmanship, reading, adding and subtracting. The 19 second grade students are "branching out" with their English lessons; telling time, days of the week, months of the year and seasons. 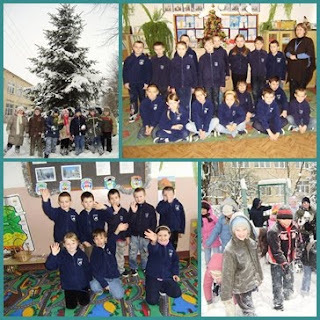 Grade 3 has 12 students, and they're finishing the first level of their education while becoming very involved in school life -- with dance, music and special celebrations. The five girls and five boys in Grade 4 are developing nature interests, and greatly enjoy field trips to the forest. Meanwhile, the 17 fifth grade students had the highest average grade in the first semester in the entire Cisie school! They're really looking forward to working with the next team of Global Volunteers! They are planning to prepare a play for their colleagues from Grades 1-3 soon. The students of Grade 6 are preoccupied with preparations for the National Examination Board competence exam which will enable them to graduate and move on to secondary school. They understand how important English is for their futures, and truly value the times they have to learn from Global Volunteers' native speakers. We have exciting upcoming plans for the classrooms as well: In March, we'll begin to set up a brand new English language lab with audio equipment, desks, chairs, white board, bookcases and bookshelves purchased with sponsors' funds.